On Tuesday 11th September, Ballindenisk is running a lunch in aid of the Jack and Jill Children's Foundation at the Castlemartyr Resort, Castlemartyr, Co Cork. Special guests and speakers are Jane Holderness-Roddam CBE LVO, Gold Medallist at the Mexico Olympics and Tommy Brennan Dual Olympian (Eventing and Show Jumping). Tickets €50 can be booked by calling Joyce at 021-4889106. 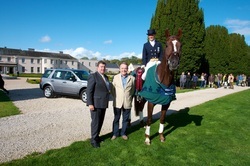 After the lunch there will be a invitational dressage competition The Castlemartyr Challenge for 3* competitors on the lawn of the hotel, starting at 3pm. What a great opportunity to watch eventing Olympians doing dressage in such a magnificent setting. Open to everyone free of charge. Jane Holderness-Roddam will judge this challenge and the winner will receive €1,000.